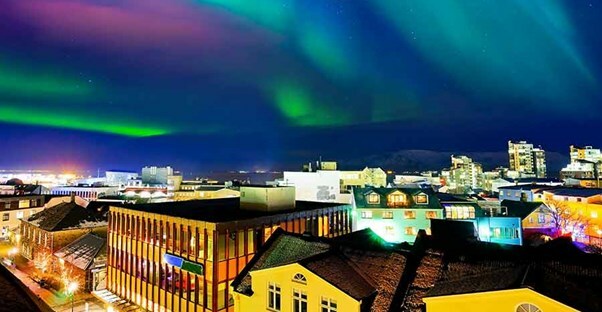 The only bad thing about your trip to Iceland will be deciding where to go while you're there. Iceland is often described as a realm of stark contrast. It’s a country where the natural elements perpetually dance between fire and frost, endless nights during the winter, and where the sun never sets during the summer. The stark contrasts found within Iceland ensures awe-inspiring sights. The Snaefellsnes Peninsula is called “Iceland in Miniature” due to the several drastically different geological features that can be found there. All of the vast features of the Snaefellsnes Peninsula are beautiful, but none are quite as unique as Snæfellsjökull. Snæfellsjökull is a twin-peaked glacier that sits over a volcano on the peninsula’s tip, surrounded by jagged lava fields and a dramatic coastline on three sides. With volcanoes come natural hot springs. The Blue Lagoon is one of the most renowned geothermal springs in the world due to its striking turquoise waters. The waters here have been said to have healing properties as they contain silica and other minerals. People flock here every year to treat a range of skin conditions and other ailments, and there is a clinic here for those seeking treatments, as well as a luxury spa. Þingvellir is the only UNESCO World Heritage Site on Iceland’s mainland. Located in an incredible valley between the North American and Eurasian tectonic plates, it boasts a spectacular landscape of lava fields and forests, interrupted with crystal clear streams. Where the plates break is home to the Silfra Diving Spot which is said to be one of the best diving experiences in the world. Half a mile away from the capital city Reykjavik are the islands of Akurey and Lundey, which are known for their gorgeous and cuddly puffin colonies. Akurey is uninhabited, but you can take a boat across from the mainland and watch the puffins nesting and tending to their young. Did you really go to Iceland if you didn’t go to the Viking museum? At the Viking World Museum, you can find a replica of a 9th century Viking ship called the Icelander, which had the claim to fame of sailing across the Atlantic in 2000. You can explore the ship and wander underneath the hull, as well as learn more about Viking history through a range of static and rotating exhibitions. Rauðasandur Beach is a sight unlike any other. At this beach, the sand is pink and red. Though Icelandic weather isn’t exactly conducive to sunbathing, this beach is still a beautiful place to walk and take in the beauty of Iceland. Perhaps on your stroll, you’ll catch a glimpse of the seals, which live nearby, or some of the thousands of unique birds Iceland is known for. Djúpalón Beach in Snæfellsjökull National Park is famed for its dramatic black sands and creative rock formations, some of which are said to look like trolls and elfin churches. This beach is also located on the Snæfellsnes Peninsula and is covered in several scenic hiking trails. Dynjandi is known for being one of the most beautiful waterfalls in the Westfjords part of Iceland and is situated on the Dynjandivogur Bay. The waterfall gives way to lots of smaller waterways as you ascend to its location before you finally see the main event, the raging waters of Dynjandi. This waterfall is located in a protected nature reserve, which also serves as a camping area. Lagjokull Glacier is one of the most scenic spots in the country due to its extreme height, from where you’ll have the best view in all of Iceland. Trying to navigate the glacial terrain of Langjokull may seem daunting, but when riding a skidoo, it’s a breeze. A skidoo is a type of snowmobile, which glides over slippery surfaces and allows you to enjoy the crisp air and blue skies of Iceland.